Baron Paganus Grimlove has been Champion to Queens and Baronies more times than he can remember, throughout Caid and in other places in the Known World. He has been Queen's Champion in six forms: archery, crossbow, rapier, light weapons, thrown weapons, and unarmored combat. He is an accomplished archer, a fencer, an armored and unarmored fighter, an equestrian, the first Queen's Champion in Caid for crossbow and thrown weapons, and the last for light weapons/shinai. He is also a teacher in his arts, a brewer (primarily of cordials), a fletcher, and a leatherworker. He is a resident of Dreiburgen, but participates everywhere in the Known World that he goes. Outside the SCA, he holds a degree in theater, and has been part of choirs as well. His wife is THL Rekon of Saaremaa. Paganus' persona is a 7th century Celt. His mother, a Viking, captured his Irish father on a raid, and brought him home as a slave. In time, she fell in love with him and freed him, and together, they became emissaries of their respective cultures. Young Paganus traveled widely, and was fostered all over the Known World. Master Nootka and Mistress Gilda are foster parents in Atenveldt. His SCA children, as well as nieces, nephews, and grandchildren are scattered far and wide over the Known World. He can't remember dates for many of these, so please, if you know, edit. Captain of Archers, Dreiburgen, 1989-1991? Earl Marshal, Dreiburgen, for 2 1/2 years and current 2016. 2011 Deputy Minister of archers and past Deputy over the years. 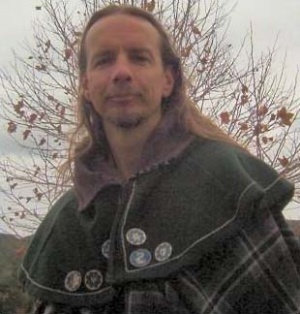 In 2011, he served as Baronial Champion to Lyondemere (archery), Angels (archery), Starkhafn (archery), Gyldenholt (thrown weapons), Kingdom Period and crossbow Division Archery champion, Known World Spear Champion (Pennsic 41), and Queen's Crossbow Champion. See also Results page for Queen's Champion and other events. Archery, Caid Archery Rank: Royal Bowmaster in all three current divisions (open 1989, period 2012, and crossbow 1990)plus the longbow division 1989(which ended when the period division was created with different equipment standards). Current Baronial Thrown Weapons Champion for Calafia, Altavia, Angels and Lyondemere. Crossbow and Archery champion for Lyondemere. He is having trouble remembering all of them, so if you know of more, feel free to add! Autocrat - Cherry Festival Demo 1984? Creator and autocrat numerous times of the Caidan Open Archery Tournament, Autocrat 1992, 1993, etc. This page was last modified on 17 June 2018, at 14:36.